Employee exposures to noise of sufficient intensity and duration can result in hearing damage. Noise-induced hearing loss rarely results from just one exposure. Usually it will progress unnoticed over a period of years. Initial noise-induced hearing loss occurs at higher frequencies where speech is found, making communication difficult. Excessive noise exposure is a cause of hearing loss. OSHA sets legal limits on noise exposure in the workplace. These limits are based on a worker's time weighted average over an 8-hour day. 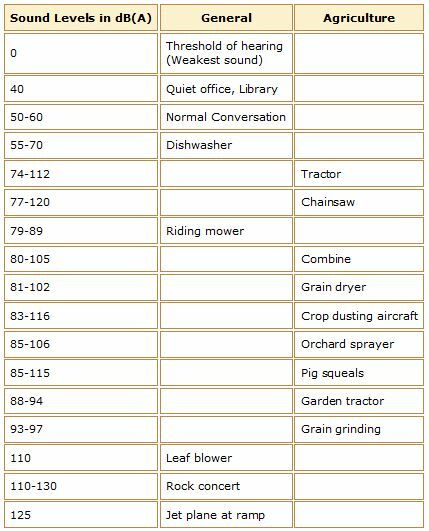 OSHA's permissible exposure limit (PEL) for noise is 90 A-weighted decibels (dBA) for all workers for an 8-hour day. The OSHA standard uses a 5 dBA exchange rate meaning, when noise levels are increased by 5 dBA, the amount of time a person can be exposed is cut in half. Employers are required to implement a Hearing Conservation Program when workers are exposed to a time weighted average noise level of 85 dBA or higher during an 8-hour work shift. Hearing Conservation Programs require employers to measure noise levels, provide free annual hearing exams and free hearing protection, provide training and conduct evaluations of the adequacy of the hearing protectors. The Ohio State Hearing Conservation Program outlines responsibilities for employees exposed to excessive noise, supervisors of those employees, administrative and engineering controls for noise exposures, and all other required elements of a hearing conservation program. Workplace noise evaluations for CFAES employees for departmental tasks thought to be above or near exposure limits, can be requested by contacting OSU EHS or CFAES Health and Safety Cordinator. If you have any questions regarding trenching and excavations, please contact Kent McGuire at mcguire.225@osu.edu or 292-0588. You may also contact the OSU Environmental Health and Safety Office online at http://ehs.osu.edu/OccHealthSafety/default.aspx or by phone at (614) 292-1284.